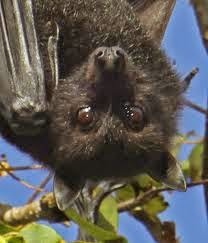 Jennie Boisvert - Councillor for Clarence Park Ward: Ever seen a fruit bat? For those who might be interested, there is currently a large group of Black Headed Flying Fox, a species of fruit bat, feeding in the evening after dark on the large Fig trees in the south western corner of Heywood Park. They can be seen most nights and seem to be most active around 6.30pm. They make quite an impressive sight for those interested in the world around them, with a wing span more than a metre. Apparently they are from a recently migrated colony which have taken up residence in the Botanic Gardens, they will exploit food resources with a 50km radius. Great for kids to see. I'll take a look as well. A gold star for councilor Boisvert, and her wonderful approach in trying to unite the population and the beautiful native wildlife. I wish her much perseverance and success.